Generations both pasta and present have had a hankering for today’s celebrated food. October 6 is National Noodle Day! Noodles are an ancient food dating back thousands of years: archaeologists recently unearthed a bowl along the Yellow River in China that contained 4000 year old preserved noodles. It was determined they were made from millet and formed by repeatedly stretching and pulling the dough by hand. The word is derived from the German nudel which, unfortunately, we have as yet been unable to translate. Noodles can be made from almost any type of dough, including wheat, rice, potato, maize, nut, and buckwheat. Once the dough is rolled flat, it is cut into a variety of shapes such as long, thin strips; bows; tubes; and pentagrams. They must be boiled in order to bring their texture back to life. Noodles are popular in many cultures around the world, particularly in Asian and Italian cuisine. Instant noodles were invented in 1958 and have revolutionized the ramen industry, bringing joy to starving college students everywhere. With so many different varieties of noodles available, we had trouble narrowing down how best to celebrate today’s food holiday. We finally decided to go simple and pick up some fresh pasta from Pastaworks, a great Italian deli/grocery store (or as they call themselves, “European market”) on Hawthorne Boulevard in Portland. 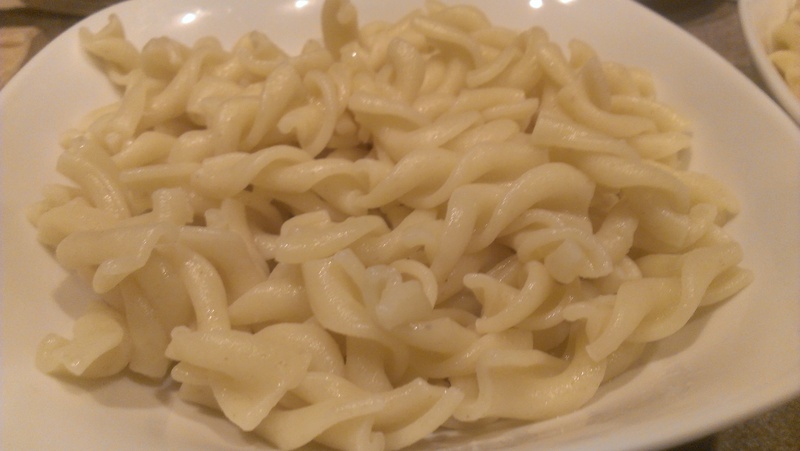 We opted for freshly made rotini, since it was more of a “noodle” than, say, ravioli would have been. Paired with their marinara sauce and a baguette, we ended up with a quick and delicious meal! Looks delicious!! Wish I could have had a bite!